Growth of Medicago truncatula plants in symbiosis with the nitrogen-fixing bacteria Sinorhizobium meliloti in individual, sterile microcosms made from standard laboratory plates permits frequent examination of root systems and nodules without compromising sterility. Plants can be maintained in these growth chambers for up to 9 weeks. Rhizobial bacteria form symbiotic, nitrogen-fixing nodules on the roots of compatible host legume plants. One of the most well-developed model systems for studying these interactions is the plant Medicago truncatula cv. Jemalong A17 and the rhizobial bacterium Sinorhizobium meliloti 1021. Repeated imaging of plant roots and scoring of symbiotic phenotypes requires methods that are non-destructive to either plants or bacteria. The symbiotic phenotypes of some plant and bacterial mutants become apparent after relatively short periods of growth, and do not require long-term observation of the host/symbiont interaction. However, subtle differences in symbiotic efficiency and nodule senescence phenotypes that are not apparent in the early stages of the nodulation process require relatively long growth periods before they can be scored. Several methods have been developed for long-term growth and observation of this host/symbiont pair. However, many of these methods require repeated watering, which increases the possibility of contamination by other microbes. Other methods require a relatively large space for growth of large numbers of plants. The method described here, symbiotic growth of M. truncatula/S. meliloti in sterile, single-plant microcosms, has several advantages. Plants in these microcosms have sufficient moisture and nutrients to ensure that watering is not required for up to 9 weeks, preventing cross-contamination during watering. This allows phenotypes to be quantified that might be missed in short-term growth systems, such as subtle delays in nodule development and early nodule senescence. Also, the roots and nodules in the microcosm are easily viewed through the plate lid, so up-rooting of the plants for observation is not required. The interaction between the legume host plant Medicago truncatula A17 and the rhizobial bacterium Sinorhizobium meliloti 1021 is one of the most tractable model systems for the study of root nodule development and nitrogen-fixing symbiosis. The genomes of both symbiotic partners have been sequenced1,2 and both plant and bacterium are amenable to genetic manipulation3,4 . Analysis of the phenotypes of both plant and bacterial mutants requires the ability to observe the stages of nodule development and to quantify the symbiotic productivity over time. Here we describe a method for observation of root nodule development of M. truncatula cv. Jemalong A17 inoculated with S. meliloti 1021 within individual microcosms made from standard, round 100 mm diameter, 15 mm deep laboratory plates (Figure 1A). The shoot is exposed and grows through a notched portal in the side of the plate (Figures 1B, 1C, and 1E). Roots are contained within the microcosms and kept sterile, while allowing observation through the lid of the plate (Figure 1D). Since the shoot is accessible, its growth is not constrained and it can be measured at periodic intervals without compromising the sterility of the root. The method of creating notched-plate microcosms was originally developed by Leigh, et al.5 for growing alfalfa plants, but it was not widely adopted in spite of its many advantages over other methods. A variation on this method was also developed for the analysis of the interaction between plant roots and mycorrhizae6. 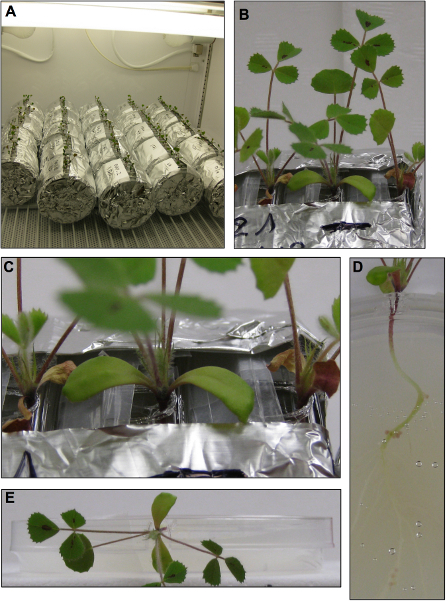 We have now adapted and optimized this method for the growth of M. truncatula plants. The advantages of this protocol over more commonly used methods are described below. There are several methods that are currently in wide use for nodulation studies of M. truncatula inoculated with S. meliloti7. The most commonly used method for large-scale preparation of nodulated roots is growth in aeroponic caissons7. In this method, plants are suspended over a large vessel and roots are aerated with a mixture of S. meliloti and nutrient solution7. This method is practical if only one genotype of S. meliloti is to be tested. Since it requires aerosolization of high concentrations of bacteria, there is a high probability of cross-contamination between caissons inoculated with different bacterial strains. Another method that is often used to prepare large quantities of inoculated plants is growth in tubs or pots of perlite, vermiculite, sand or calcined clay that are infused with nutrient solution and inoculated with S. meliloti7. This method requires the use of open tubs or pots, and requires watering and replenishment of the nutrient solution. Another disadvantage of pots is that plants must be removed from this particulate matrix for examination of the roots and nodules. Another drawback of this method is that a large area of incubator space is required when many different S. meliloti genotypes are to be compared, because a separate pot must be used for each bacterial genotype. The "Leonard jar" is a variation on this method8,9 . A Leonard jar is composed of two sterilized vessels stacked one on top of the other and connected by a wick. Growth medium is placed in the lower vessel and drawn through the wick by capillary action into a growth matrix of perlite, vermiculite, sand or calcined clay in the upper vessel. The seedling(s) are placed in the growth matrix and inoculated with S. meliloti. This method does not require watering, but examination of roots and nodules requires that the seedling be removed from the particulate growth matrix. There are several methods that do permit easy examination of roots. One of these is the transparent plastic "growth pouch"7. A disadvantage of this method is that frequent watering is required since only ≤10 ml liquid medium is optimal for growing M. truncatula in pouches7. Pouch experiments are also usually limited to ~2 weeks7, due to breakdown of the paper wick within the pouch. Two other methods that are commonly used are similar to our method in that the plants are grown on agar and the roots are visible, but these methods also have disadvantages that our procedure avoids. In these methods, plants are completely contained within 24.5 cm x 24.5 cm agar plates sealed around the top with porous surgical tape or grown in agar-slant tubes stoppered with cotton plugs or plastic caps7. Both of these methods allow easy examination of roots and can be kept sterile. However, the agar slant tubes are usually grown with only 20 ml agar medium7 and require watering and nutrient addition for long-term growth of plants. Plants grown within the 24.5 cm x 24.5 cm agar plate microcosms have sufficient moisture and nutrients for long-term growth, but the growing shoot quickly becomes constrained within the enclosed plate microcosm and ethylene gas can build up inhibiting nodulation7. In the procedure described here, the shoot is exposed and grows freely outside the microcosm which contains ~70 ml of media, allowing long-term growth. The procedure described here may be useful not only for the study of nodulation of legume plants, but also for the study of root phenotypes of other mid-size plants. The difference between these microcosms and a traditional polycarbonate plant tissue-culture jar is that roots in the plate microcosms described here grow on the vertical surface of the agar rather than down into a horizontal layer of agar at the bottom of the jar. This allows the root to be lifted off of the agar surface with minimal damage to root hairs and minimal adhesion of agar to the root surface, which facilitates the examination of root hairs by microscopy. Performing steps 1, 2, 4, and 6 in a sterile laminar flow hood is recommended. Note: M. truncatula A17 seeds used in these studies are produced under cooled greenhouse conditions at ~22 °C, or in a plant growth room maintained at 22-26 °C with ~150-400 mmol/m-2 s-1 light. Pour seed germination plates: Use 100 mm square plates (15 mm deep) and pour autoclaved 1.1-1.2% w/v purified agar10 to a depth of 3-5 mm. Each plate will be used to germinate ~0.25-0.5 g of seed (equivalent to 63-125 seeds/plate). Note: It is critical to use plant cell culture-tested, purified agar for all plates described in this protocol. The vendor and catalog number information for the agar is listed in the Table of Specific Reagents and equipment. Scarify/sterilize the M. truncatula A17 seeds: Weigh sufficient seeds for the desired number of seedlings. (M. truncatula A17 seeds are ~4 mg each) Place seeds in sterile 125 ml flasks with sterile foil covers (0.25-0.5 g seed/flask; this is ~63-125 seeds) and pipette 20 ml of concentrated (96%) H2SO4 along the sides of the flask. Note: Acid scarification will sterilize the seeds. Also, by pipetting the acid along the sides of the flask, it will re-sterilize the inside of the flask that has come into contact with the unsterilized seeds. Break up clumps of seed with a sterile glass pipette. Swirl each flask frequently for 10-12 min. Small, brown pits will become visible on the seeds. These are tiny holes in the seed coat11. Note: Wear eye protection and gloves when working with concentrated H2SO4. Remove H2SO4 and rinse seeds: When at least 10% of the seeds have small brown pits, or 12 min have passed, whichever comes first, remove ALL acid from the flasks with a sterile glass pipette. (Place waste acid into a 1-2 L beaker containing at least 300 ml tap water. This will dilute the acid and prevent overheating.) Tilt the flask to collect the remaining acid in the curve of the flask and use a small glass pipette to remove all the remaining acid. If residual acid remains, it will react with the rinse water, heat the seeds and kill them. Rinse seeds by quickly pouring 100 ml of sterile ultrapure water into each flask. The excess volume of water will dilute the acid and prevent overheating and seed damage during the reaction of the acid with the water. Pour off the water and flame-sterilize the lip of the flask. Rinse seeds 8-10x with 50 ml of sterile ultrapure water. Swirl the flask during each rinse. The flask should be considered sterile at this point and the lip of the flask should be flamed before each rinse. Let seeds imbibe overnight: After the last rinse, pour 50 ml sterile ultrapure water into each flask, replace the sterile foil cover on each flask and place at 4 °C in the dark overnight. Place seeds on germination plate: After letting seeds imbibe overnight, pour off water, rinse 2x with ~25 ml ultrapure water, then add 20 ml sterile ultrapure water, swirl to resuspend seeds and pour them onto a 1.1-1.2% agar germination plate from step 1.1. If seeds remain in the flask, add more water and pour again. Distribute the seeds from each flask to one plate (63-125 seeds/plate). Swirl the plate to distribute the seeds. The seeds should be distributed evenly in a 4-5 cm band at one end of the plate. This will be the "top" of the plate. The "bottom" 5-6 cm should be kept free of seeds (Figure 2A). Draw off the water with a sterile pipette. Tilt the plate at a 45° angle to let the remaining water drain to the bottom of the plate. Replace the lid on the tilted plate and protect from light. Plates should be allowed to drain 10-20 min. (Figure 2B). Set up germination: Remove all water that has collected at the bottom of the tilted plate with a sterile pipette. Replace the lid and seal the plate with parafilm. Wear gloves and keep sterile (Figure 2C). Stack the germination plates and then turn all of them up at a 90° angle. The seeds will be lying on the vertical surface of the agar. Fully imbibed seeds should easily adhere to the agar. The roots will grow downward (Figure 2D). 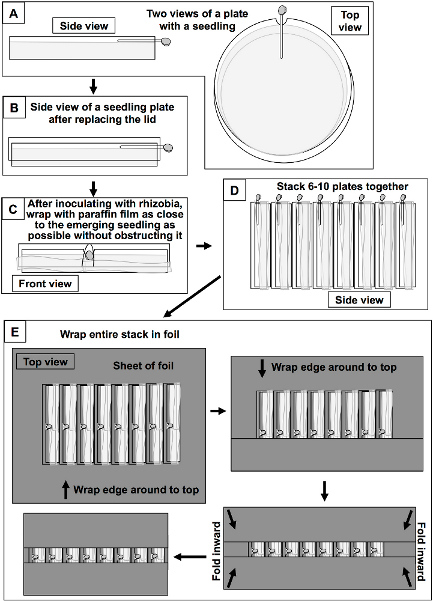 Wrap the stack of germination plates in foil to block light and keep at 25 °C for 3 days. Note: If germination proceeds for less than 3 days, roots may be too short to reach the agar in microcosms. If germination proceeds more than 4 days before transfer to microcosm plates, survival of seedlings will be poor. If M. truncatula ecotypes or mutants with slower germination rates are to be compared, the slowly-germinating ecotype should be allowed to germinate longer than 3 days. Prepare Jensen's medium12(see Table 1 for composition), allowing ~70 ml medium for each microcosm. Prepare in pitchers or flasks that are convenient for rapid pouring (no more than 1-2 L per pitcher) and leave a magnetic stir bar in the pitcher during autoclaving. After medium has cooled to ~55-65 °C, supplements have been added, and pH has been checked (see Table 1), pour into round 100 mm diameter, 15 mm deep plates. Plates should be poured ~0.9-1 cm deep (~70 ml/plate). Components of Jensen's medium can form a cloudy precipitate, so it is important to return the pitcher to the magnetic stir plate periodically to prevent components from settling out. Precipitates may be visible in the plate after they solidify, and do not affect performance as long as they are evenly distributed among the plates. Stack plates during pouring to prevent the formation of condensation on the plate lids. 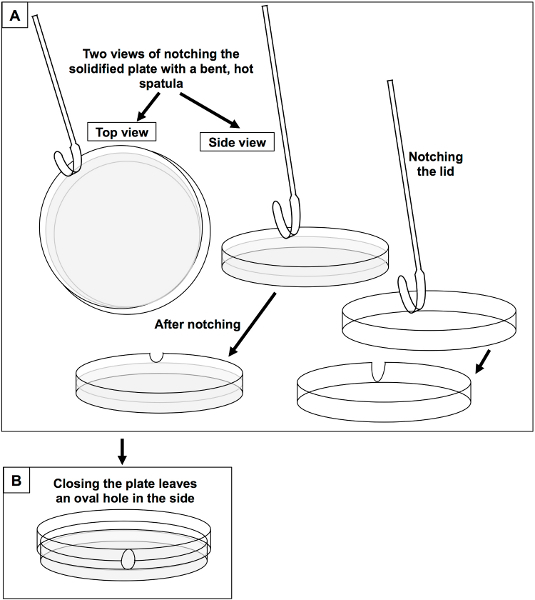 After Jensen's plates have solidified, notch both plates and lids with a weighing spatula that has been bent into a U-shape5 (Figure 3A). Heat the bend of the spatula with a burner until red hot, notch 5-6 plates and then heat again. When the notched lid is placed on the notched plate, this will create an oval portal through which the shoot of the seedling will grow (Figure 3B). If notched plates are to be stored, wrap individually with paraffin film..
Two days before plant inoculations, start cultures of all S. meliloti strains to be inoculated onto seedlings. Cultures should be grown in LBMC (Luria-Bertani [Miller]) medium13 supplemented with 2.5 mM MgSO4, 2.5 mM CaCl2, and appropriate antibiotics (TY medium also works well). As little as 2-3 ml of each culture will be sufficient. Grow at 30 °C with shaking for 2 days until cells are dense. For most plant inoculations, the growth phase of the S. meliloti is not critical. Typically, late log or early stationary phase cells are used. After 3 days, open a germination plate (prepared in step 1) and immediately flood with sterile ultrapure water. Dip forceps in ethanol and flame briefly to sterilize. Use sterile forceps to gently push the root tips of all seedlings under the water to prevent drying. Roots will range from 2-6 cm long. The majority will be 3-4 cm. Select seedlings with straight roots and no obvious defects. Check the lids of the Jensen's medium microcosms for the build-up of condensation. Flick the lid to remove the condensation or replace it with a new notched lid. If there is an excess of condensation on the lid, the seedling root may adhere to the lid and then die after the condensation dries. Using the forceps, gently pick a seedling from the germination plate by the cotyledons and lay the root on a Jensen's medium microcosm. Make sure the root tip is in contact with the agar. Gently remove the seed coat if it is still present. The seed coats should be loose after soaking in water for 5-10 min. Gently tease the seed coat with the forceps until it gives way, and discard. The cotyledons and approximately 0.5 cm of shoot should protrude out of the U-notch in the plate (Figure 4A). Carefully replace the lid of the plate with the U-notch of the lid over the seedling, creating a portal for the seedling (Figure 4B). Set plates aside in horizontal stacks until all seedlings have been placed on microcosms. After laying out all seedlings, allow them to sit on the horizontal Jensen's microcosms while the S. meliloti inoculum suspensions are being prepared. Check S. meliloti cultures periodically after inoculation to be sure that they are growing. After 2 days growth, the OD600 should be between 2 and 4. Pipette 0.5 ml of each culture into a sterile 1.5 ml tube and centrifuge to pellet. Remove supernatant. Wash cells two times in either 0.85% sterile NaCl or sterile ultrapure water. Resuspend cells in 0.5 ml 0.85% sterile NaCl or ultrapure water. Measure the OD600 of a 1/10 dilution of resuspended S. meliloti cultures from step 5.3. Based on this reading, make a suspension of each culture in sterile ultrapure water at OD600 = 0.05. If the cell density is too high, nodulation may be inhibited. Make enough of the dilute suspension so that 100 μl can be inoculated onto each seedling. The cloudiness of the OD600 = 0.05 suspension should be just barely perceptible by eye. Immediately prior to beginning inoculations, check for wilted seedlings that have not survived the transfer to the Jensen's medium microcosms. Replace those seedlings with fresh seedlings from germination plates. Open each microcosm and inoculate 100 μl of the appropriate S. meliloti suspension onto the seedling root. Replace the lid and set aside in horizontal stacks of 6-10 microcosms. For each S. meliloti strain to be compared, inoculate at least 15 plants. For strains that have subtle differences in symbiotic productivity, inoculate 30-35 plants. Leave at least 10 plants uninoculated as a negative control. Inoculate 30-35 plants with S. meliloti 1021 or other appropriate wild type strain to serve as the positive control. After the S. meliloti suspension has had time to adsorb onto the root surface and the suspension liquid has soaked into the agar (at least 20 min. ), wrap each plate individually with paraffin film. Plates should be wrapped up to the very edge of the notch, but the paraffin film should not block the growth of the seedling (Figure 4C). At the time of wrapping, make a final check for roots adhered to the inside of the plate lid. To remove adhered roots from the lid, lay the plate flat on the bench and tap or flick the lid to knock the root back down onto the agar surface. Line up the seedling portals of each stack of 6-10 plates. Lay the stack at a 90° angle with the seedlings pointing upward (Figure 4D). 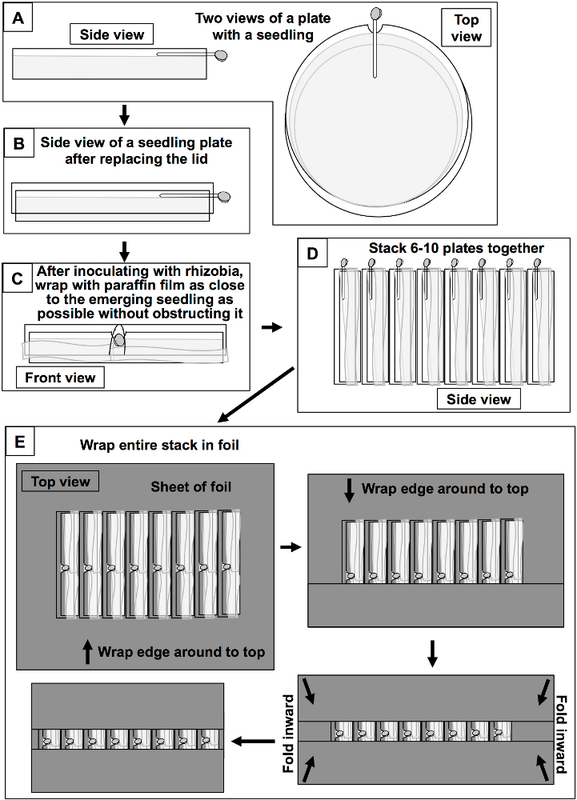 The stickiness of the paraffin film will hold the plates in place long enough to wrap the entire stack in foil, leaving a 1-2 cm strip unwrapped where the seedlings emerge (Figure 4E). The foil will protect the roots from light. Place the foil wrapped stacks in a lighted growth chamber or growth room at 21-25 °C, 60-70% relative humidity and 100-175 μmol/m-2 s-1 light on a 16 hr light/8 hr dark cycle (Figure 1A). Under these growth conditions, prolonged incubation at light levels higher than 200 μmol/m-2 s-1 can have a detrimental effect on plant growth. Plants can be maintained in microcosms for up to 9 weeks. Nodule number can be quantified at a series of time points by unwrapping the foil from each stack and counting nodules. Developing nodules on plants inoculated with S. meliloti 1021 wild type are apparent by 10-14 days after inoculation. Symbiotic productivity can also be measured at each time point by measuring the length of the emerging shoot. Final quantitation of symbiotic productivity is usually performed at 7 weeks after inoculation by detaching the shoot and measuring the fresh weight of the shoot. This step can be performed as late as 9 weeks if longer growth is desired. The preparation and inoculation of these plate microcosms is relatively simple compared to most other methods described in the Introduction. Use of these microcosms also permits prolonged plant growth (up to 9 weeks) without watering or nutrient supplementation, maintenance of root sterility, both easy examination of roots and protection of roots from light, unconstrained growth of plant shoots, easy access to the shoot for length measurement, and removal of plants from the microcosms with minimal damage to root hairs. Figure 1A shows young seedlings growing in microcosms in an incubator. 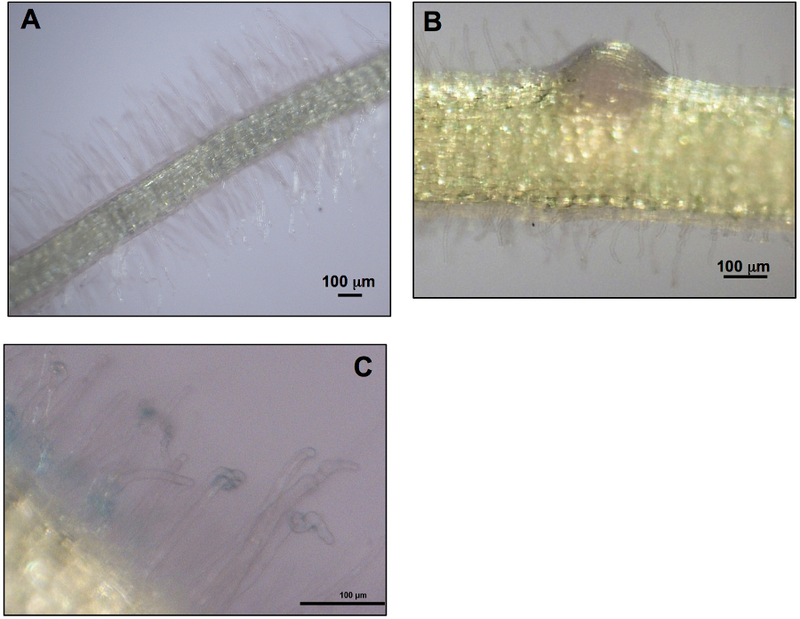 The images in Figures 1B-1E show several different views of microcosms containing M. truncatula A17 plants inoculated with wild type S. meliloti 1021. If packed tightly, >220 microcosms will fit on a 73.8 cm x 67.5 cm incubator shelf. Figures 1B and 1C show microcosms in a foil-wrapped stack with plants emerging from the portals in the microcosms. Figure 1D shows a single microcosm with the foil removed and the root and nodules showing through the front of the plate. Figure 1E shows the same microcosm lying flat with the plant emerging from the portal in the plate. The shoot length can be measured from the point of emergence from the microcosm (Figure 1C) without disturbing the plant. 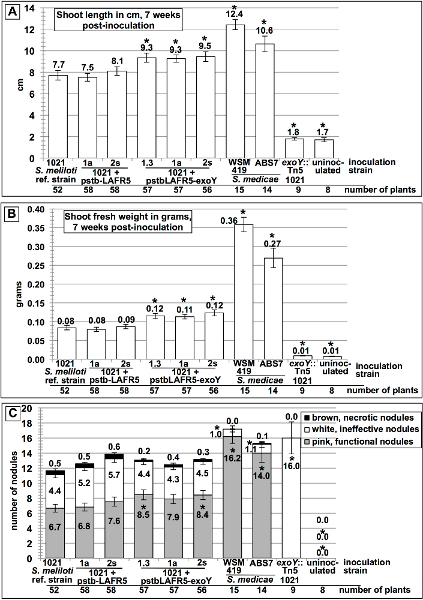 Figure 5A shows shoot length data for M. truncatula A17 plants inoculated with wild type S. meliloti 1021 compared with uninoculated plants at 7 weeks and 9 weeks post-inoculation. Growth in the microcosms is ideal for collecting a series of timepoints of nodule development and shoot length. At the final timepoint, the shoots are clipped off for measurement of shoot fresh weight (Figure 5B). Figure 6 shows examples of 3 symbiotic phenotypes at 7 weeks post-inoculation. The relative symbiotic productivity of M. truncatula A17 plants inoculated with different S. meliloti strains is quantified by shoot length (Figure 6A) and shoot fresh weight (Figure 6B). The number of root nodules on plants inoculated with these strains is shown in Figure 6C. A pink color due to the production of leghemoglobin indicates that nodules are functional and capable of nitrogen fixation, while small white nodules are usually nonfunctional and/or aborted and brown nodules are senescent and necrotic14-18. The comparison in Figure 6 shows that the symbiotic productivity of M. truncatula A17 plants inoculated with S. meliloti 1021 carrying the pstb-LAFR5-exoY plasmid, which overexpresses the ExoY undecaprenyl-phosphate galactose phosphotransferase, is greater than that of wild type S. meliloti 1021 and strains carrying the negative control plasmid pstb-LAFR5. These ExoY over-expressing strains produce more of the symbiotic exopolysaccharide succinoglycan than the control strains. The ability to quantify differences in symbiotic phenotypes that take several weeks to manifest is a major advantage of this method. For all measures of symbiotic productivity on M. truncatula A17, the Sinorhizobium medicae strains WSM419 and ABS7 perform better than S. meliloti 1021 (Figures 6A-6C). (The data from Figure 6 originally appeared in Jones (2012)19.) At the time that the microcosm is disassembled and shoot fresh weights are measured, roots can also be imaged by microscopy. Figure 7 shows representative views of M. truncatula A17 roots after removal from microcosms. The root hairs have experienced minimal damage since the roots lay on the surface of the agar and are not up-rooted from a horizontal layer of agar. Plants can be maintained for up to 9 weeks in these microcosms because there is ~70 ml of agar growth medium in the plate. After longer growth periods, some plants may begin to dry. Seven weeks of growth is optimal for the symbiosis with S. meliloti 1021. For the more efficient symbiosis of M. truncatula A17 with S. medicae WSM419 or S. medicae ABS7, a shorter growth period of 4-5 weeks is optimal. Table 1. Jensen's medium agar protocol for plate microcosms. Preparation instructions for Jensen's medium. Add above ingredients, and mix with magnetic stir bar. Autoclave 45 min, liquid cycle, with stir bar in the pitcher. Cool with stirring until it is not painful to pick up the pitcher with your bare hands. Note: Be sure to resuspend the precipitate in the trace minerals before dispensing. Add 0.25 ml 4 N NaOH per L, while stirring. Note: pH 5-10 range paper works well. pH should be ~7 Allow a few seconds for full color development. If pH is not correct, there may have been a preparation error. Note: Expect to get ~15 plates per liter. Figure 1. Views of microcosms containing plants inoculated with S. meliloti 1021 A) Plants in microcosm plates growing in an incubator. B) M. truncatula A17 plants inoculated with S. meliloti 1021 wild type growing through the notch in the top of Jensen's agar microcosms. C) Additional close-up view of the plates in B showing plants growing through notches in microcosms. D) One of the microcosm plates from B and C with the root nodules imaged through the lid. E) The plate from D lying flat with the shoot emerging from the notch. Figure 2. Seed germination plate set-up. A) Seeds are distributed across one-half of a 100 mm square plate. B) Agar surface is drained by allowing water to collect at the bottom of a tilted plate. C) Plates are wrapped in paraffin film, stacked and D) the stack turned at a 90o angle and wrapped in foil. Figure 3. Construction of microcosms by notching Jensen's plates with a bent spatula. A) A metal weighing spatula that has been bent to form an oval is flame-heated and used to notch a U-shaped hole in the side of the plate and in the side of the lid. The bottom of the U-notch in the plate should be at the top of the agar surface. The bottom of the U-notch in the lid should be all the way at the top of the lid. B) Replacing the lid onto the plate creates an oval-shaped portal through which the seedling can protrude. Figure 4. Insertion of seedlings into microcosms. A) Two views show how the seedling root should lay on the agar surface with the cotyledons and ~0.5 cm of shoot protruding out of the U-notch in the plate. B) and C) Placing the lid on the plate with notches lined up will create an oval portal for the seedling. Wrapping the plate tightly with paraffin film will keep the lid from moving and prevent drying. D) Plates can then be stacked together in groups of 6-10, and E) wrapped with foil. Click here to view larger figure. Figure 5. Representative symbiotic phenotypes after 7 weeks growth and 9 weeks growth of M. truncatula A17 in individual microcosms. A) Shoot length of plants inoculated with S. meliloti 1021, and the shoot length of uninoculated plants were measured at 7 weeks without removing the plants from microcosms. At 9 weeks post-inoculation, shoot length was measured (A), and then shoots were clipped and weighed (B). Figure 6. Representative symbiotic phenotypes after 7 weeks growth of M. truncatula A17 in individual microcosms. exoY-overexpressing strains of S. meliloti 1021 have enhanced symbiosis on the host plant Medicago truncatula A17. The symbiotic productivity of S. meliloti 1021 on M. truncatula A17 is improved in strains that overexpress the undecaprenyl-phosphate galactose phosphotransferase encoded by exoY. Symbiotic productivity is measured as (A) shoot length in cm and (B) shoot fresh weight in grams. The numbers of pink, functional nodules (bottom graph bar); white, ineffective nodules (middle graph bar); and brown, necrotic nodules (top graph bar) are shown in (C). The symbiotic productivity and nodule number of plants inoculated with S. medicae strains WSM419 and ABS7 are also shown. Asterisks over graph bars denote a statistically significant difference from the 1021 wild type reference strain in an unpaired t-test. Plants inoculated with an exoY::Tn5 null mutant that does not produce any succinoglycan had similar shoot lengths and fresh weight to uninoculated plants, and produced only white, ineffective nodules. The graphs in (A) and (B) were originally published in19. Click here to view larger figure. Figure 7. Roots imaged on a dissecting microscope after removal from microcosms. Roots can be easily removed from the microcosms for imaging with minimal damage to root hairs because they lie on the surface of the agar. Images show roots of M. truncatula A17 at 10 days post-inoculation (A, B) and 14 days post-inoculation (C). The roots shown were inoculated with S. meliloti 1021 wild type (A), an S. meliloti strain carrying an eglC::GUS fusion (B), and an S. meliloti strain carrying an SMc00911::GUS fusion20 (C). GUS staining of S. meliloti cells carrying the SMc00911::GUS fusion is visible on the root hairs and the root surface in E. Bar corresponds to 100 μm. Click here to view larger figure. There are several steps of the protocol that are critical for success: 1) The necessity of using purified, plant cell-culture tested agar cannot be overemphasized. This is not critical for alfalfa seedlings, but it is critical for growth of M. truncatula A17. 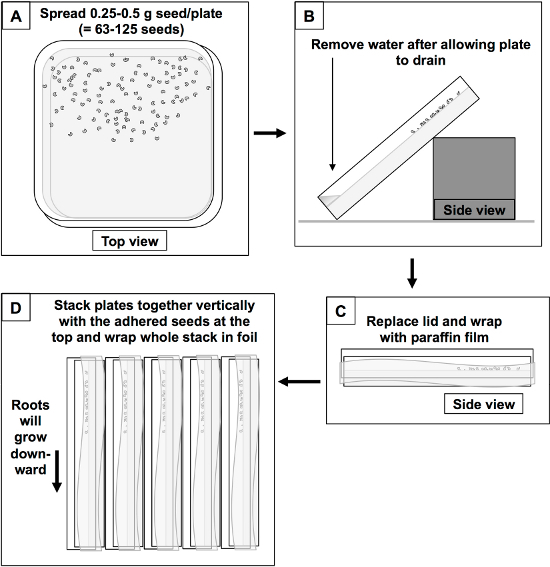 2) It is important to germinate seedlings on vertical agar plates as described in Step 1. The widely-used technique of germinating seedlings on an inverted horizontal surface in a 15 mm deep plate7 is not advised for this protocol because the seedling roots will be too short and/or not straight. Seedlings with straight-growing roots of 2-4 cm in length are ideal for transfer from germination plates to microcosms. Three days of growth in the vertical germination plates is usually ideal for roots to attain this length. 3) It is also critical to avoid contamination of seedlings with rhizobia prior to inoculation. Prior to transfer of seedlings from germination plates to microcosms, the work area should be thoroughly cleaned with ethanol and all instruments used in the transfer should be frequently flame sterilized. Another potential source of contamination can be avoided by preparing the S. meliloti strain suspensions for inoculation of microcosms in a separate work area from that used for seedling preparation. Fungal contamination of the microcosms can also be avoided by removing all remnants of the seed coat from the interior of the microcosm, since fungal spores may be embedded in the coat. 4) Seedling survival can be maximized by keeping seedling roots moist and in contact with agar at all times, and by very gentle treatment during transfer. Any seedling with the root trapped in agar in the germination plate should be excised carefully to avoid damage to the root. A high yield of viable plants can be achieved by making a final check for wilted seedlings in the stacks of microcosms before beginning inoculations, and replacing them with new seedlings. If seedlings are in good condition and have not adhered to the inside of the plate lid, less than 5% of seedlings should need to be replaced at this stage. Obstruction of shoot growth from the microcosm can be prevented by making sure that no remnants of the seed coat are constraining the cotyledons and that the microcosm is parafilm-wrapped carefully so that the shoot will not be obstructed. We routinely use this method to study symbiosis in the host plants M. truncatula A17 and alfalfa, and we are currently optimizing the technique for growth of other M. truncatula cultivars, other species of Medicago and species of Melilotus (sweetclovers). We have not yet tested this method with M. truncatula A20, which is an ecotype that is used as a genetic mapping partner with A17. We have found that M. truncatula cv. R108 does not grow well on the purified plant cell-culture tested agar that we are currently using and we are trying to identify another agar preparation or an agar-substitute for use as a microcosm growth-substrate for this cultivar. In comparing the method described here with other commonly-used methods for analysis of the M. truncatula A17/S. meliloti symbiosis, we have found this to be by far the best method for simultaneously comparing the symbiotic performance of a large number of S. meliloti strains. We routinely set up 250 microcosms at a time (10 different strains of S. meliloti inoculated onto 25 plants each.) When only one genotype of S. meliloti or S. medicae is to be used, and cross-contamination is not a risk, aeroponic caissons or growth pouches may be a more appropriate method. This plate microcosm method is also the best method for making periodic observations of the progression of nodule development and symbiotic productivity over a long period of time. Phenotypes that manifest in the later stages of symbiosis, such as nodule senescence, can be studied more easily with this method than with other protocols. This work was funded by the USDA National Institute of Food and Agriculture, Agriculture and Food Research Initiative grant 2010-65108- 20582 to K.M.J. We thank Brian K. Washburn for critical review of the manuscript.